What is a cardiac loop event recorder? 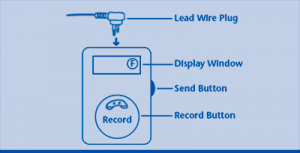 A cardiac loop event recorder is a battery-powered portable device that you control to tape-record your heart’s electrical activity (ECG) when you have symptoms. There are two types of event recorders: a loop memory monitor and a symptom event monitor. Cardiac event recorders and other devices that record your ECG as you go about your daily activities are also called ambulatory electrocardiographic monitors. A cardiac loop event recorder makes a record of your electrocardiogram (ECG or EKG) when you have fast or slow heartbeats, or feel dizzy or like you want to faint. It can also be used to see how you respond to medicines. The electrodes (small sticky pads) need to be attached securely to the skin on your chest to get a clear recording. Wipe skin clean with an alcohol swab. Dry with the gauze pads provided before attaching the electrodes to your chest. Attach the electrodes to the lead wires before attaching the electrodes to your chest. Attach the electrodes on your chest in the position shown in the diagram. 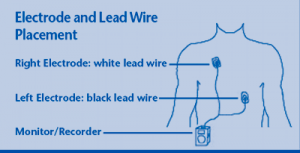 White lead wire to right electrode, black lead wire to left electrode. Press electrode firmly to skin. Discard any electrodes with dry gel. Change the electrodes each day, or more often if they are loose/not sticking well. Insert the plug from the lead wires into the top of the recorder/monitor after you have attached the electrodes to your chest. When you have your heart symptom (such as dizziness, chest pain, palpitations, light-headedness, shortness of breath) press the RECORD button on the monitor. Relax and remain still while the device is recording. You will hear a series of 5 tones or “beeps” which lets you know it has stopped recording. After recording, you will see an “F” in the display window. This means the monitor is full and cannot record any more. You must transmit, that is, send in your recording. The device will continue to beep every few minutes until you transmit your recording. Sometimes, the record button may be pressed by mistake. If so, the monitor will beep a series of 5 tones and a “F” will appear in the display window. You do not need to transmit this recording, but you do need to erase it. Unplug the lead wire at the top of your monitor and press the send button on the side of the monitor. When the whistling sound stops, plug the lead wire back in. You must use a regular telephone (a landline) to send in your recording. Do not use a cell phone or a cordless telephone. Remove the lead wire plug from the top of the monitor. your home telephone number is always your identification number. The # symbol on your telephone is called the “pound” key. State your full name, the date and the time. Your symptoms when you recorded. Where you were and what you were doing when you recorded. Place the monitor face-up on a table or flat surface next to your telephone. Place the mouthpiece (the part you speak into) of the telephone over the RECORD button of your monitor. Press the SEND button (located on the side) to start the transmission. You will hear a whistling sound. After the transmission is complete, the whistling sound will stop. You may plug the lead-wire back into the monitor. Check the batteries each time you turn on the monitor. If the battery symbol appears on the monitor, the battery is low and must be replaced with 2 AAA batteries (2 triple A batteries). You must disconnect the lead wire plug and remove the monitor and electrodes to bath or shower. If you have questions or concerns about the operation of your recorder, call 905-597-7111 and leave a message on the answering machine. A technologist will receive your message and will call you back within 24 hours during weekdays (Monday to Friday, 9am – 4 pm). If you are concerned about your heart symptoms, contact your doctor.